Aloha! Visiting Scotland from Hawaii in mid-June with my husband and 11-year-old son. We'll arrive in Edinburgh around 11:00 am by train from London (after 8 days there) and spend that night in Edinburgh before hitting the road early the next morning. What should be our Edinburgh priorities in just half a day (a Saturday)? Tentatively thinking Edinburgh Castle, then walk the Royal Mile to Holyrood Palace? (We may also have a few hours the day we leave). Suggestions for car rental? The next day we're planning to drive to Inverness where we'll spend that night. Best route? Must stops along the way and/or around Inverness? Next day we'll drive to Isle of Skye where we'll spend 2 nights in Portree. Best route and stops along the way? Must do's on Isle of Skye with probable 1.5 - 2 days? Then on to Stirling for a night. Again, route and stops? The next day we'll go back to Edinburgh to return car and spend a few more hours if we have it before catching a train back to London around 5:30 pm. I appreciate any any suggestions anyone has. We already have lodging reservations in the above towns, but can cancel them if there's a better itinerary for this amount of time? We've never been to Scotland and are hoping to squeeze in as much as we can. We will have an 11 year old with us, but he's very bright and finds history interesting. We'd like to see castles, nature / scenery, learn some history, etc. I've also recently learned many of my ancestors immigrated to the US from Scotland in the 1700s, so curious if I feel a connection to the place. (Interestingly, my 14th great grandfather was brother to the Wizard of West Bow, who sounds horrible, if anyone has heard of him? Lol. The family name of ancestors are Weir / Vere and also Hutton). We live on a very small island, so long car rides might be difficult (new experience for us) - would be good to break it up. Thank you to anyone who has advice to give. Aloha @MauiJen! I'm sure you'll have an amazing time in Scotland, albeit if the weather is slightly different to what you're used to! If you book your accommodation in central Edinburgh you'll be surprised how much you can see in one day! You should be able to walk the length of the Royal Mile (including the Queen's Palace at one end and Edinburgh Castle at the other), as well as enjoy exploring the twisting streets of old town and see all the key sites like Greyfriar's, St Giles Cathedral, the Grassmarket & Victoria street etc. You should have plenty of time to head into new town as well, and if you like a birds eye view of the city then Scot Monument is well worth a visit! I don't have a car myself so I'm going to let others weigh in on the best route for driving up to Inverness, etc. @Samantha_Grant @fishypro - not sure if either of you can advise here? Thank you so much @VisitScotlandAmanda - very helpful! Adding those Edinburgh sites to my list! Major Weir gets a mention in there somewhere. I knew he had a sister who was executed with him but not sure of the brother. He lived at the bottom of what’s now Victoria Street by the Grassmarket. I studied history so you’ll find my blogs packed with history but it’s not too heavy, I promise! To get to Inverness I’d head North up the A9. Try to visit Culloden Battlefield, Clava Cairns and Fort George up there if you can. Also a dolphin spotting boat trip from Inverness Marina is worth doing. Head to Skye via Loch Ness for some stunning scenery. On Skye if you’re reasonably fit it’s worth climbing up to the Old Man of Storr. Personally, I find the much hyped Fairy Pools overrated but the Fairy Glen at Uig is stunning and worth visiting. You’ll also find Skye, Stirling and the area around Inverness on my blog too. Enjoy your trip and make sure you share some photos. Thank you so much @Samantha_Grant!! Visiting your blog now!! Do you have an Instagram account? You've given me a lot of great advice and I've added it all to my list. I also wish we had more time in Edinburgh! I think that's my biggest concern - that there just won't be enough time. We could change our return train to London to the next day, giving us another not quite full day. I'm going to look into that possibility and talk to my husband. Thanks again! If your travels ever bring you to Hawaii, especially Maui, I'd love to help out! @Samantha_Grant your blog is fabulous!! I can see I'll be spending hours there!! And your dog! Love. Found your Instagram too. Yay! I concur with @Samantha_Grant that you're spending a criminally low amount of time in Edinburgh and if you can get a day's extension, you should. West Bow is a very scenic photo spot in Edinburgh so I had to lookup who the wizard was and the story is fascinating! I should drop a mention of Edinburgh's National Museum (a must-visit if your son has an interest in science, Scotland was the birthplace of many a modern day invention) and the National Gallery They are both free, centrally located and quite compact so it shouldn't take too much out of your time. All my Scotland transport has been public transport / tour guide based so I cannot comment on the driving times and routes themselves but I can definitely comment on recommended stops. Edinburgh - Inverness: The Hermitage walk starts just off the A9 after the village of Birnam and is a must-stop (my own photos + experience). 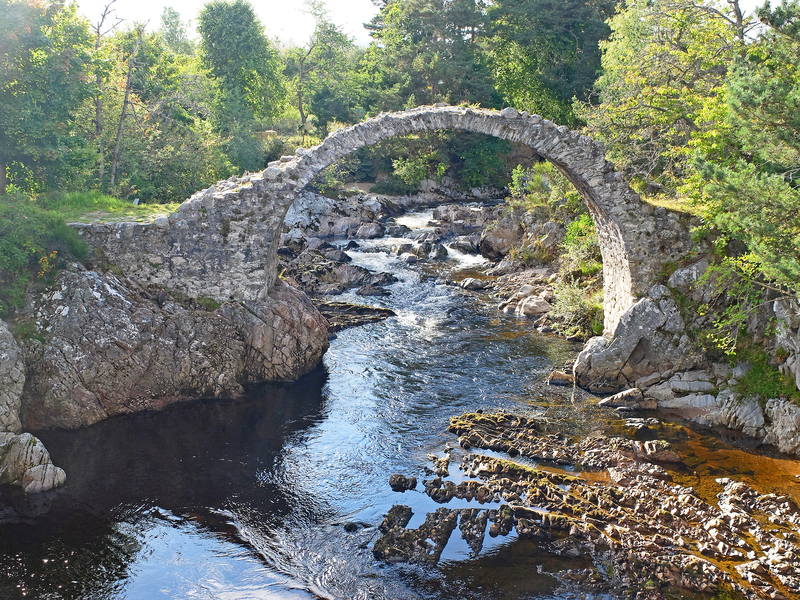 Another highly recommended stop is Carrbridge, not only can you see a uniquely shaped 300 year old bridge (pic below), nearby Landmark forest park is a huge hit with kids local to the area. Queen's view, Pitlochry (for its salmon ladder), Aviemore and Blair Atholl (castle, Falls of Bruar & Highland shopping mall) are also worthy stop considerations. 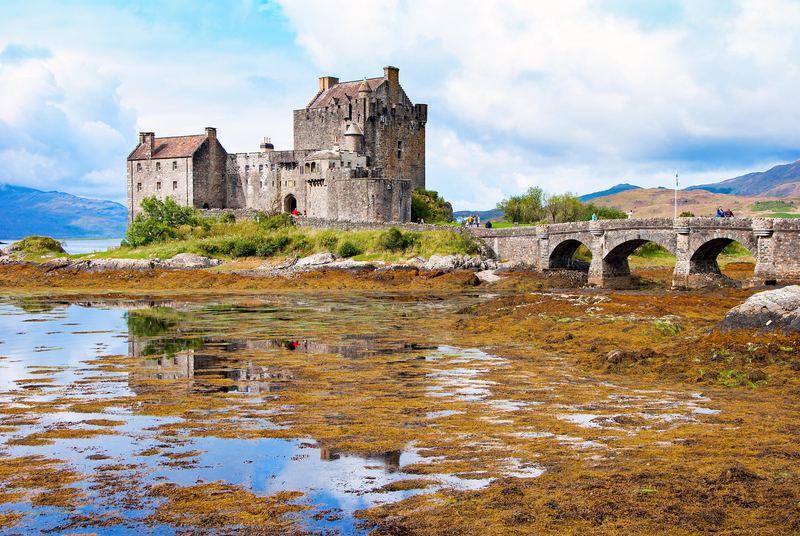 Inverness - Skye: Eilean Donan castle is a fairytale castle on the route and is a must visit. I also recommend stopping at Sligachan on Skye to stretch your legs and reward yourself with a drop-dead gorgeous view after a long drive. 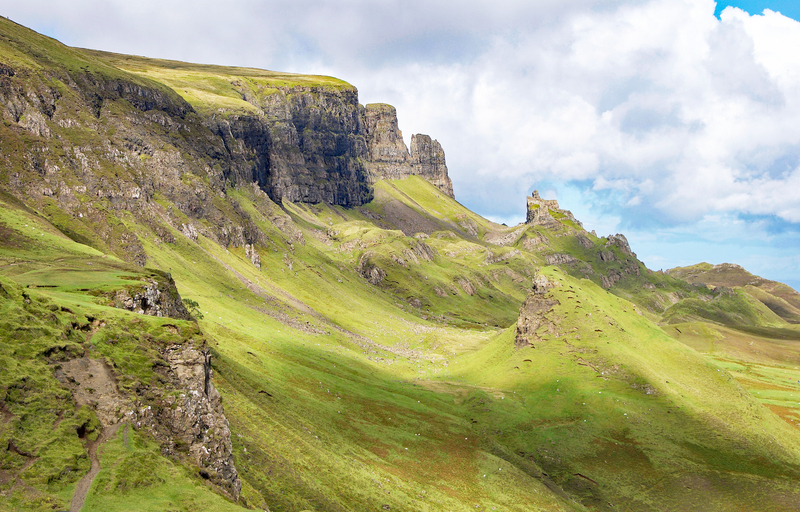 Isle of Skye: I have visited Skye once a year for 4 years straight and enamoured by it. Of all the views on Skye (Fairy Pools, Storr, etc), Quiraing pictured below is my absolute favourite. Skye - Stirling: Glencoe is a obvious stop. Be aware that even though the Glencoe visitor centre is very nice, the 3 sisters is what you want to stop near. Tour buses will indicate your destination The village of Killin is a great stop as well with fewer tourists and a picturesque stream + falls. Feel free to follow up. All my Scotland travel posts are linked from this page on my blog. I'm on Instagram as well, I'd love to connect as Hawaii, Alaska and Yellowstone are 3 things I've missed visiting inspite of living for a few years in Seattle! Would love to get the inside scoop on Maui and other islands before my inevitable visit. For your leg from Skye to Stirling - head south on Skye to get the ferry from Armadale (make sure your satnav knows it is Armadale Ferry - there's another Armadale in Scotland!) to Mallaig - very easy car ferry - you can book (and should) in advance. Shortly after Mallaig you will pass the sands of Morar which are incredibly beautiful beaches with powder sand looking out over the most gorgeous views (if the weather is kind!) Even coming from Hawaii (and I have visited both Oahu and Maui) I think you would be impressed by the Silver Sands of Morar. From Mallaig the trip takes you through Glenfinnan and if you time it right you will see a steam train travel over the famous Harry Potter viaduct - what 11 year old wouldn't like to to see the real Harry Potter viaduct? The scenery on that part of the route is lovely. There are lots of lochs and stopping off points before you get to Glenfinnan itself too. From Glenfinnan you can take effectively the main road to Stirling to go through the magnificent Glencoe Then onwards to Stirling you will pass through the Loch Lomond and Trossachs National Park with absolutely loads of detours possible - you can't go wrong really. Have a wonderful trip! PS again - I had posted lovely pics of Glenfinnan taken last time we visited but again the site disallowed as I'm new - but if I manage to I'll post them for you. But there are loads online and on this site. Thank you so much @Katepick!! Great suggestions! My son is a HUGE Harry Potter fan and we had planned on the Glenfinnan Viaduct, but weren't sure of the best route - this helps tremendously! And I've added your suggestions to my list. Thanks again! Look forward to your photos if you're able to post them! @Horizons I realized I never responded to you here. Your post has been extremely helpful!! Thank you so much! And your photos are beautiful! I started following you on Instagram and have enjoyed all of your travel photos. As our trip gets closer I may ask you more questions via Instagram if that's ok? @MauiJen, absolutely, and thanks for the appreciation! I am happy to answer any Scotland travel questions on any channel. And I shall return the favour when I finally plan my Hawaii trip! There's two other places called Armadale, actually!